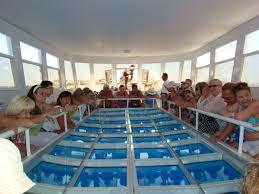 In this tour you will discover and observe the underwater world of the Red Sea on a glass bottom boat. You will see the colorful coral reefs and different kind of fishes. This tour is two hours, and available everyday. The maximum capacity of the boat is 10 people. All boats are licensed and covered by insurance. All transfers from the hotel to the dock. US Dollars, Euros, Sterling and Egyptian pounds are accepted.